Ritterkreuz (Knight's Cross) award ceremony for Luftwaffe fighter ace, Oberfeldwebel Rudolf Müller (Flugzeugführer in 6.Staffel / II.Gruppe / Jagdgeschwader 5 "Eismeer"), that was held at Petsamo airfield (Finland) in 19 June 1942. 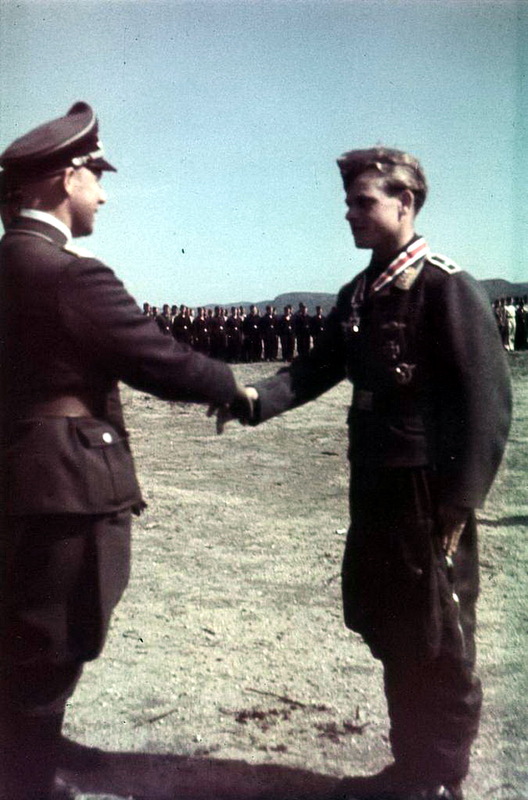 Müller was awarded the Ritterkreuz after he scored his 46th air victory. The opening months of the German air campaign above the Arctic Circle were fought by a miscellany of units before a flurry of redesignations saw the piecemeal emergence of Jagdgeschwader 5 (JG 5) proper during 1942. This Geschwader was somewhat unusual in that it faced two ways at once. One half of it was employed in defending the western coast of Norway against attack by the RAF (and USAAF), while the other half was engaged against the land and naval air forces of the Soviet Union primarily over the White Sea area and along the strategically vital Murmansk railway line. The latter took supplies delivered by the Allied Arctic convoys down into central Russia. Despite this diversity of tasks, JG 5 produced a formidable number of high-scoring Experten (or at least those Gruppen operating in the eastern parts did). In addition to a handful of truly stellar performers who racked up three-figure totals, there were at least half-a-dozen semi-centurions among their ranks. One of the first to come to prominence was 6./JG 5’s Feldwebel Rudolf "Rudi" Müller (born 21 November 1920). He was credited with five Russian-flown Hurricanes downed over Kola Bay on 23 April 1942. 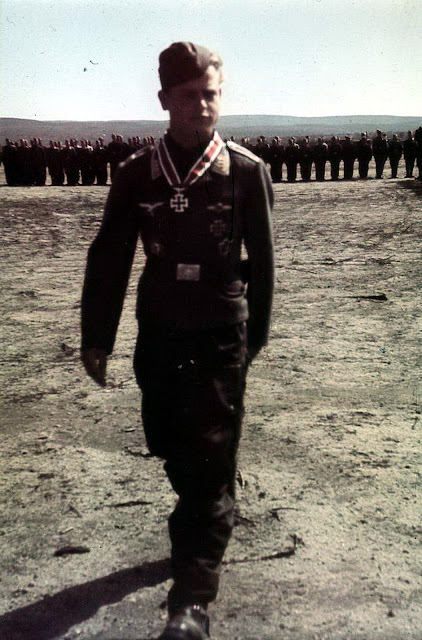 In less than two months his score had risen to 46, for which he was awarded the Ritterkreuz des Eisernen Kreuzes (Knight’s Cross of the Iron Crosses) on 19 June. And he had more than doubled that total again – to a final score of 94 – before he was himself lost on 19 April 1943. On the morning of that date, "Rudi" Müller, by now an oberfeldwebel and currently JG 5’s highest scorer, was piloting one of the six Bf 109s that took off from Salmijärvi, in northern Finland, for a freie Jagd sweep of the Murmansk region. They had been warned to keep a special eye on the Soviet fighter base at Vaenga, on the eastern shore of Kola Bay. And with good reason, for approximately 40 enemy aircraft rose to intercept them. 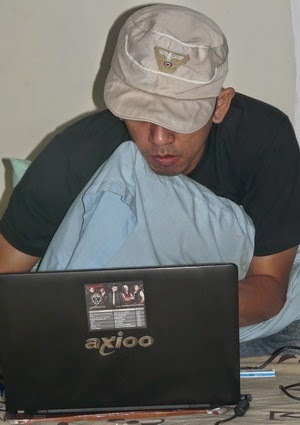 A fierce dogfight developed. At least one Red Air Force Airacobra was sent down, but another latched onto the tail of Müller’s Gustav and got in an effective burst. Müller tried to escape by diving away in a steep spiral, but his machine was too badly damaged and he was forced to belly-land on the surface of a frozen lake. While the battle continued to rage overhead, his victor is described as having "put down alongside the stricken Messerschmitt". But of Müller there was no sign – just a set of snow-shoe tracks heading off into the tundra. "Rudi" Müller remained at large behind enemy lines for several days before finally being captured. Like so many others who disappeared into Soviet captivity, his ultimate fate is unknown. One statement released long after the war asserted that he had been killed while trying to escape in 21 October 1943, but there were also reported sightings of him in a Russian gaol as late as 1947, and one of the many rumours circulating about him at that time among other German prisoners was to the effect that "Rudi is serving as a flying instructor for the Ivan".